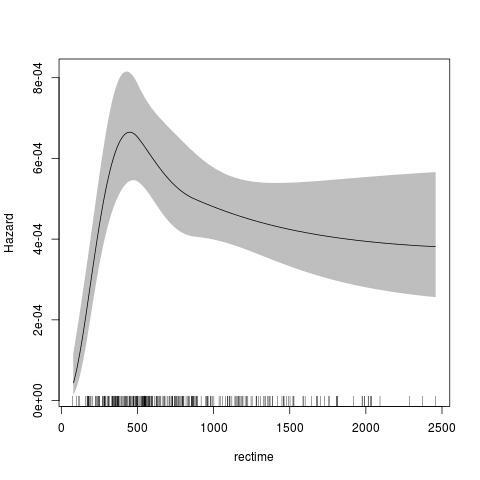 R implementation of generalized survival models (GSMs) and smooth accelerated failure time (AFT) models. For the GSMs, g(S(t|x))=eta(t,x) for a link function g, survival S at time t with covariates x and a linear predictor eta(t,x). The main assumption is that the time effect(s) are smooth. For fully parametric models with natural splines, this re-implements Stata's 'stpm2' function, which are flexible parametric survival models developed by Royston and colleagues. We have extended the parametric models to include any smooth parametric smoothers for time. We have also extended the model to include any smooth penalized smoothers from the 'mgcv' package, using penalized likelihood. These models include left truncation, right censoring, interval censoring, gamma frailties and normal random effects. For the smooth AFTs, S(t|x) = S_0(t*eta(t,x)), where the baseline survival function S_0(t)=exp(-exp(eta_0(t))) is modelled for natural splines for eta_0, and the time-dependent cumulative acceleration factor eta(t,x)=\int_0^t exp(eta_1(u,x)) du for log acceleration factor eta_1(u,x). NOTE: versions 1.4.1 and 1.4.2 of rstpm2 included a critical bug in the predict function for type in "hr", "sdiff", "hdiff", "meansurvdiff", "meanhr", "or", "marghr" or "uncured". The smoothers for time can use any transformation of time, including no transformation or log(time). B. Another class pstpm2 is the implementation of the penalised models and corresponding penalized likelihood estimation methods. The main aim is to represent another way to deal with non-proportional hazards and adjust for potential continuous confounders in functional forms, not limited to proportional hazards and linear effect forms for all covariates. Functional forms can be represented in penalized regression splines (all mgcv smoothers ) or other parametric forms. The default for the parametric model is to use the Royston Parmar model, which uses a natural spline for the transformed baseline for log(time) with a log-log link. The default for the penalised model is similar, using a thin-plate spline for the transformed baseline for log(time) with a log-log link. The advantage of the penalised model is that there is no need to specify the knots or degrees of freedom for the baseline smoother. - Fixed a critical bug in the `predict` function for comparisons of hazards, including type="hr", type="hdiff" and type="marghr" (introduced in 1.4.2). - Possible breaking change: for the `predict()` functions for `stpm2` and `pstpm2`, the `keep.attributes` default has changed from `TRUE` to `FALSE`. Any code that used `predict()` and needs the `newdata` attributes should now add the `keep.attributes=TRUE` argument. The previous default was noisy. - Possible breaking change: the derivative of the design matrix with respect to time now defaults to being calculated using log(time); the old calculation can be found using `log.time.transform=TRUE`. This is expected to provide more accurate gradients, particularly for very small times. + `stpm2`: parametric generalised survival models, possibly with clustered data (Gamma frailties and normal random effects), relative survival, robust standard errors, rich post-estimation and plots. + `pstpm2`: penalised generalised survival models, possibly with clustered data (Gamma frailties and normal random effects), relative survival, robust standard errors, rich post-estimation and plots. 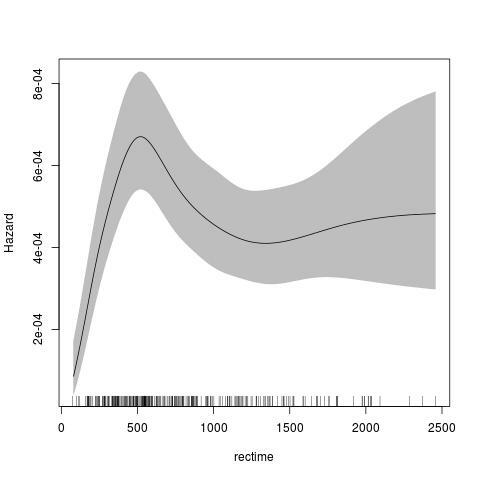 + `aft`: parametric accelerated failure time models, with more limited post-estimation and plots. - Links for the generalised survival models include log-log, -logit, -probit, -log and Aranda-Ordaz.